All loves takes … is a little magic. Historian Amelia Chadwick works at her grandfather’s quiet bookstore, yet dreams of adventure. She also has a bit of trouble trusting and being trusted after her grandfather’s prize book is stolen on her watch by her ex-boyfriend. Amelia may no longer trust in the magic of love, but adventure is right around the corner when she’s sent to Hawaii on business. 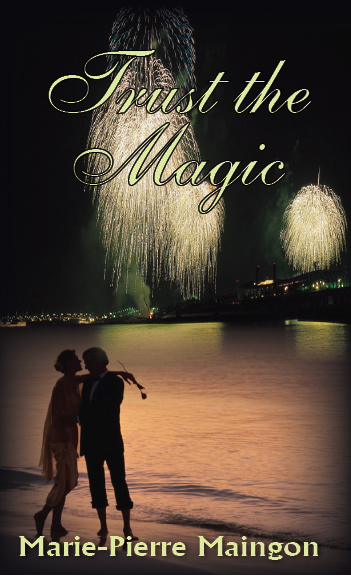 Honolulu boat owner Mac Robbins has no trouble at all believing in magic, and is hardly surprised when gorgeous Amelia stumbles into his life. The attraction between them sparks dangerously, but Amelia’s even more dangerous pursuit of the stolen book and her crazy ex might sink their romance before it has a chance to sail.